Hazrat Mirza Masroor Ahmad addresses non-Ahmadi guests and members of Lajna Imaillah on day 2 of Jalsa Salana Germany. On Saturday 6 June 2015, the World Head of the Ahmadiyya Muslim Community, the Fifth Khalifa, His Holiness, Hazrat Mirza Masroor Ahmad addressed an audience of more than 1,000 non-Ahmadi guests on the second day of the 40th Annual Convention (Jalsa Salana) of the Ahmadiyya Muslim Community in Germany. 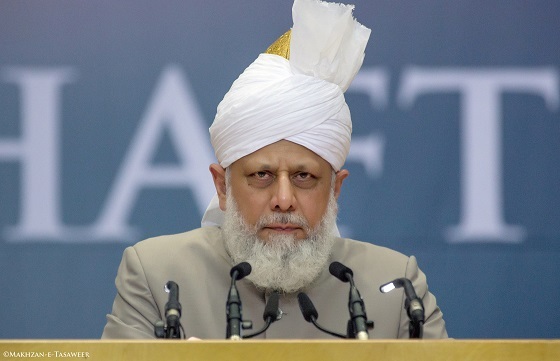 His Holiness quoted extensively from the Holy Quran to disprove allegations that Islam advocates extremism or violence of any kind.Hazrat Mirza Masroor Ahmad began his address by stating that the efforts of the Founder of Islam, the Holy Prophet Muhammad (peace be upon him) towards establishing peace in the world were “incomparable”. Hazrat Mirza Masroor Ahmad said that in this era the Founder of the Ahmadiyya Muslim Community, His Holiness, Hazrat Mirza Ghulam Ahmad of Qadian (peace be upon him) was sent by Allah the Almighty to revive the true and peaceful teachings of Islam. The Khalifa said that those who sought to defame and discredit Islam had taken the wars fought during early Islam completely out of context. Earlier in the day, His Holiness, Hazrat Mirza Masroor Ahmad directly addressed the members of the Lajna Imaillah (Ladies Auxiliary Organisation) in which he spoke of the importance of obedience to the Holy Quran and to the Holy Prophet Muhammad (peace be upon him). His Holiness said that whilst it is alleged Islam’s teachings restrict women and limit their freedom, the truth was that Islam had established the rights of women and given them true freedom. His Holiness said that within the Ahmadiyya Muslim Community, women organised their own events and appreciated this independence. Share the post "Head of Ahmadiyya Muslim Community – “Islam’s reality will dawn upon the world”‏ "